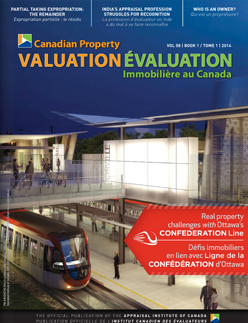 This article is intended to inform appraisers and real estate-related professionals about the challenges involved in appraising expropriated property and the procedures necessary to support opinions of value associated with a partial taking. An expropriated property owner is entitled to the market value of the land taken, plus any diminution in value sustained by land not taken. Depending on the nature and extent of a taking, including the public works, the land not taken can have its value impacted. The extent of the impact on value is a function of whether the land not taken is a viable or non-viable remainder. After a partial taking, the remainder constitutes an entirely new property, which requires preparation of a separate stand-alone appraisal, independent of the appraisal of the original property. Public works frequently result in property expropriations. Appraisals are required to assist in ascertaining the amount of compensation to which an affected property owner is entitled. In a property expropriation, a partial taking always leaves behind un-expropriated property. The land not taken can possess varying degrees of utility, depending on the nature and characteristics of the land, the presence and type of any improvements, and the spatial relationship of the land to abutting property, including the part taken. The land not taken in an expropriation of a property is known as the remainder. A partial taking that causes a natural severance will always have more than one remainder. Every remainder should be viewed as a new property requiring an appraisal, prepared independently of the before-taking appraisal. The valuation principles employed in the initial appraisal should also be applied to the appraisal of the remainder, including identifying the larger parcel as part of highest and best use analysis of the remainder. Both appraisals, however, must comply with the relevant provisions of the applicable expropriation act, ignoring the scheme when it is appropriate to do so. There are two types of remainders in a property expropriation. In this article, they are referenced as viable remainders and non-viable remainders. A viable remainder is one that is marketable as a standalone entity. A non-viable remainder is essentially the equivalent of a remnant or uneconomic remainder or uneconomic remnant, terms that are in common usage in jurisdictions throughout the United States. For a remainder to have value, it must have four economic factors: (1) demand (it must be desired; fewer buyers create less demand); (2) utility (it must have use to buyers); (3) scarcity (it must be relatively scarce, as too much supply will depress the price); and (4) purchasing power (there must be a financial capability to buy; fewer buyers depress price). Appraisers are called upon by expropriating authorities and by impacted property owners to prepare appraisals within a statutory framework. The role of the appraiser is to conduct a broad enquiry into relevant economic factors and develop well-supported opinions of value within that framework. This necessitates an understanding of valuation procedures unique to expropriation. An opinion of market value of a property must be predicated on a highest and best use. Highest and best use is a fundamental question of fact that must be answered before an appraiser can offer an opinion as to market value. All relevant aspects of highest and best use analysis applicable to the expropriated property must be explored and sufficiently documented to support the opinion of market value. An appraiser’s primary objective is to develop fact-based opinions of market value, but market value does not apply in a bilateral market. A bilateral market is one in which a single seller is confronted by a single buyer. In this situation, the value of a non-viable remainder is affected by the interdependence of the non-viable remainder and an adjoining property under different ownership, combined to form a single larger parcel. Conveyance of a property under this condition does not meet the test of market value, which assumes an active market of many buyers and sellers, and a choice of available properties. Market value does not apply to a non-viable remainder, as it has no independent highest and best use. Instead, the value of a non-viable remainder is tied to the market value of a larger parcel by way of “value in contribution.” Contributory value is measured in terms of the amount the non-viable remainder adds to the value of the larger parcel or as the amount that its absence detracts from the value of the larger parcel. (ii)such personal and business damages, resulting from the construction or use, or both, of the works as the statutory authority would be liable for if the construction or use were not under the authority of a statute. For a property owner to sustain a claim for injurious affection arising out of a property expropriation, it must be demonstrated that the partial taking caused the remainder’s value to change. Generally, the following criteria must be satisfied for a valid injurious affection: (1) the remainder must be “held with” the expropriated land; (2) the potential loss in value of the remainder must be occasioned by the use or construction of the anticipated public works of the expropriating authority upon the expropriated land; (3) the potential loss in value of the remainder must not be too remote; and (4) the potential loss in value of the remainder must be permanent rather than temporary. As long as the expropriated land (the part taken) is part of one holding and is so inextricably linked to the remainder as to diminish the existing or potential use or marketability thereof, the property owner is entitled to compensation for the consequential injury to the part not taken. Countless legal, physical and economic factors have the potential to affect the market value of a remainder. The factors and their importance differ depending on the type of property, its use or potential use, and the presence of improvements. Factors affecting rural properties often differ from those that affect urban properties. Some of the potential factors that can impact the value of a remainder include title restrictions, easements, exposure, accessibility, lot configuration, dimensions and size, topography, drainage, crop production, diminished utility of existing improvements, increased fixed costs, non-compliance with zoning provisions, and change in highest and best use. also influence the value of the remainder, due to the time value of money and whether the public works restrict or enhance the utility of the remainder. A viable remainder is a stand-alone larger parcel with an independent market value and highest and best use. However, if the part taken has a greater value as part of the “whole” property in its highest and best use prior to expropriation, the property-owner is entitled to the contributory value of the part taken and there is no injurious affection. A non-viable remainder has no independent highest and best use, and has limited marketability. Unless it can be tied to an adjoining property as part of a larger parcel, for which a highest and best use can be established, a non-viable remainder will have nominal or no market value. Only land from an adjoining property that is not part of any other land expropriated can be considered in defining the larger parcel. In all jurisdictions in Canada, no expropriating authority can compel a property owner to relinquish more land than is necessary to achieve the public purpose underlying an expropriation. Therefore, when a partial taking results in a non-viable remainder, a separate and independent estimate of value (i.e., value in contribution) is required of the non-viable remainder. In some instances, it might be possible to initiate a “cost-to-cure” that will transform a non-viable remainder into a viable remainder. For example, if legal access can be re-established for a remainder that is landlocked, it may prove cost-effective to remedy the deficiency. This remedy is only beneficial if the cost-to-cure as a measure of injurious affection (damages) does not exceed the diminution in market value sustained by the remainder without curing the deficiency (i.e., lack of legal access). In addition to the estimated cost of curing the deficiency, determining if a cost-to-cure is appropriate should consider whether (1) a purchaser of the remainder could obtain all approvals necessary to implement the cure; (2) the cure can be implemented for a fixed price; (3) a purchaser would expect to be compensated for risk and entrepreneurial incentive in undertaking the cure; and (4) the cure can be achieved within a reasonable time frame (i.e., not remote). The overriding consideration is to ensure that the contemplated cure is both practical and warranted. All three abutting properties taken as a “whole” for the same expropriation – no larger parcel identified. Two abutting properties taken as a “whole” for the same expropriation, leaving one adjoining property and the non-viable remainder to be potentially combined as one larger parcel. One abutting property taken as a “whole” leaving two adjoining properties and the non-viable remainder to be potentially combined as two larger parcels. Only part of each abutting property taken for the same expropriation, with the three remainders to be potentially combined with the non-viable remainder to create one larger parcel. Only part of two abutting properties taken for the same expropriation, with the two remainders to be potentially combined with the non-viable remainder to create one larger parcel. Only part of one abutting property taken for the same expropriation, with the one remainder to be potentially combined with the non-viable remainder to create one larger parcel. These permutations are by no means exhaustive, especially if there is more than one non-viable remainder, but the challenge of identifying the larger parcel is a prerequisite in assessing the prospects of a non-viable remainder, and estimating its contributory value. The contributory value on a non-viable remainder will also be influenced by the size of the larger parcel to the extent that the unit rate attributable to the “size” variable will decrease as parcel size increases, and vice versa, all other elements of value remaining constant. In Canada, there is no corresponding appraisal instruction at either the federal or provincial level to identify the larger parcel. Instead, most expropriation statutes make indirect references to the larger parcel. For example, Public Works and Government Services Canada’s March 2007 Valuation Guidelines on Expropriation under Section 2.12 in respect of “a limited interest or a partial taking,” the value assigned to the security interest must be “in the same proportion that the value of the land taken bears to the whole of the land.” Further, Section 26(3) states that the part taken “if not marketable on its own, then it is valued at the greater of, the value it contributes to the whole property, or the value of equivalent land,” factors that are considered in defining the larger parcel. The underlying foundational requirements established by the courts in defining the larger parcel are unity of ownership, unity of contiguity, and unity of use (highest and best use). The courts have ruled that the unities of ownership, contiguity, and use (highest and best use) need not be simultaneously present as of the date of valuation, as would be likely when dealing with a non-viable remainder. Title restrictions: Legal use precluded by restrictive covenant or use limited to a specific legal use. Legal permissibility: Use must be legal or capable of being achieved (i.e., rezoning and/or Official/Master Plan amendment) within a reasonable time frame. Physical adaptability: Site and/or improvements, including off-site infrastructure, must be capable of supporting the use. Externalities: Impact on use by external forces that effect property values. Probability of use: Must have a greater than 50% chance of being achieved. Timing of use: Must be achieved within a reasonable time frame. Demand: There must be an active market for the use. Financial feasibility: Prices and/or rents must be sufficient to support the use. Sustainability: The use must be maximally productive over a long time frame. Purchaser/user: The most likely purchaser or user must be identified. Every partial taking differs in its impact on highest and best use analysis. If there is some doubt or uncertainty as to the physical or legal viability of a remainder for any economic use, independent advice from a qualified third party should be sought. Of course, as the appraiser is ultimately responsible for the opinion of highest and best use and the corresponding market value estimate, the appraiser must be satisfied that the conclusions of any third party are reasonable and appropriate before relying on them. When confronted with a non-viable remainder, it may be possible to mitigate damages (injurious affection). This outcome can sometimes be achieved by estimating its contributory value to an adjoining property by combining the two to create a larger parcel, akin to an assembly involving separate rights of ownership. In this case, the larger parcel does not necessarily have, or require, unity of ownership. For every potential larger parcel, highest and best use requires an analysis of the abutting property, with and without the non-viable remainder, accompanied by an estimate of market value of the abutting property (if it has its own highest and best use) and an estimate of market value of the larger parcel. The difference between the two estimates of market value represents the maximum contributory value of the non-viable remainder to the market value of the larger parcel. Every larger parcel that incorporates a non-viable remainder, with only one prospective purchaser, is characterized as a bilateral market, which can significantly impact the contributory value of the non-viable remainder. Where there is potential for more than one larger parcel, the contributory value of the non-viable remainder is enhanced by the prospect of more than one buyer. A larger parcel that combines an abutting non-viable property (often the result of a partial taking involving the same expropriation) and a non-viable remainder of the subject property only requires an estimate of the market value of the larger parcel. In this scenario, both property owners are likely to enjoy equal bargaining power. Prorating the market value of the larger parcel, in its highest and best use, on the basis of an overall unit rate and applying the unit rate to the area of land in each ownership may be an appropriate method of determining the contributory value of each property, provided no improvements are involved. The concept of the larger parcel is an integral part of highest and best use analysis. This analysis must reflect the most probable and financially feasible economic use. It establishes the basis for estimating both the market value of the larger parcel and the contributory value of the non-viable remainder. The maximum contributory value of a non-viable remainder as part of a larger parcel, before considering the appropriateness of a potential discount associated with a bilateral market, can be estimated by deducting all anticipated costs, including an allowance for entrepreneurial incentive, associated with consolidating title to both properties and achieving the highest and best use of the larger parcel. In effect, the maximum contributory value of a non-viable remainder, pursuant to any adjustment for trading in a bilateral market, as part of a larger parcel represents the after-taking value of the remainder for inclusion in the before- and after-taking test applied in the appraisal of a partial taking. Depending on the interrelationship of the larger parcel and the non-viable remainder, it is possible to have a highest and best use for the larger parcel that differs from the highest and best use of the abutting property. As long as an adjoining property owner can benefit financially from acquiring a non-viable remainder, it is assumed that the adjoining property owner is a “willing buyer.” Typically, an adjoining property owner will pay something less than the maximum contributory value for a non-viable remainder to achieve a financial benefit. The discount associated with conveyance of a non-viable remainder in a bilateral market depends largely on the extent the non-viable remainder enhances the value of the adjoining property. Where a non-viable remainder only marginally enhances the utility of an adjoining property, the value in contribution may be virtually non-existent relative to the maximum contributory value to the larger parcel. Conversely, if an addition of a non-viable remainder changes the highest and best use of an abutting property from residential to commercial as part of the larger parcel, it is likely that no discount to the maximum contributory value on a proportionate basis would be warranted. The following text from a September 2000 report of the City of Ottawa describes a non-viable parcel (analogous to a non-viable remainder from a previous expropriation) and its disposition. Reportedly, the contributory value of the non-viable parcel was based on an appraisal, but there is no indication as to how the appraiser arrived at the value conclusion, and whether there was any discount associated with the conveyance of the non-viable parcel in a bilateral market. In 1998 the Region bought the property…for the reconstruction of Hawthorne Road….The settlement [price of $226,550] was for land and buildings and included compensation for entitlements pursuant to the Expropriations Act. The buildings were demolished, road works were completed and a legal survey was undertaken to define any surplus land [remainder]…. The surplus property is a rectangular site consisting of 3,295 m2 [35,467 sf]…fronting onto Hawthorne Road between Stevenage Road and Hunt Club Road in the Cities of Gloucester and Ottawa. The property is zoned M4(1.0) & I-Hf(1.0) – Industrial. The parcel does not meet the minimum requirements for the zone, and cannot be developed on its’ own. It is therefore considered a non-viable parcel, of use only to the abutting owner. The adjacent owners…contacted the Region and a purchase price of $80,000 was negotiated. In some jurisdictions40, the policy pertaining to the disposition of a remnant parcel is specifically tied to the enhancement of highest and best use of an adjoining property: “[A] county governing authority is authorized to sell and convey parcels of small or narrow strips of land, so shaped or so small as to be incapable of being used independently as zoned or under applicable subdivision or other development ordinances or land use plans, or as streets, whether owned in fee or used by easement, to abutting property owners where such sales and conveyances facilitate the enjoyment of the highest and best use of the abutting owner’s property.” This policy of maximizing the value of a remnant parcel on disposition is consistent with the objective of reducing injurious affection when dealing with a non-viable remainder. While the ultimate objective is to mitigate damages, reduce injurious affection sustained by a non-viable remainder, the process by which that objective is achieved is through enhancement of the market value of an adjoining property, when considered as part of a larger parcel. When estimating the contributory value of a non-viable remainder to an adjoining property, value in contribution is based on the highest and best use of the larger parcel, as suggested by the Ontario Ministry of Transportation: “If it is concluded that the remainder is not viable, the impact of adding the Ministry lands to each adjoining property must be investigated and analysed. The value of the remainder will be its value in contribution to the adjoining property (or properties) as part of a larger parcel. The objective of the appraisal will be to estimate the increase in market value to that adjoining owner’s holding if they were to acquire the Ministry lands.” Any financial benefit resulting from a reduction of injurious affection can only be applied to the remainder. The admitted lack of relationship to the Expropriation Act as indicated in the quotation from his report. The failure to establish many of the assumptions such as the zoning of the property. The failure to consider that the property at issue is and always has been under agricultural production. The lack of similarity between the comparables and the land at issue…. The admission that he was not appraising land of the shape or size of the land at issue. The admission that, in his hypothetical, he assumed that land was marketable whereas the land at issue was not. The three non-viable linear strips had no independent highest and best use. They should have been appraised as part of a larger parcel in its highest and best use, in a manner reflective of a non-viable remainder, but without any potential discount, and in compliance with the relevant expropriation act. Offering evidence as an independent expert witness requires an appraiser to assist the trier of fact with objective, relevant, and well-founded opinions of value. The market value of a remainder juxtaposed against the before-taking value reveals the clearest and most accurate measure of injurious affection (damages) and betterment (enhancement in value) occasioned by a partial taking. Provided provision is made to account for the contributory value of the part taken, the property owner is always assured of receiving at least the market value of the land taken. Identify the larger parcel(s) in the context of the remainder, while simultaneously conducting highest and best use analysis. Identify the property rights to be appraised. Identify relevant value-influencing property characteristics. Identify the most likely purchaser(s) of the remainder. Identify the appropriate method(s) of valuation. Ascertain the type of market data to be collected. Derive an estimate of value (i.e., market value or value in contribution). When a remainder shows signs of betterment in the form of “special” benefits peculiar to it (i.e., benefits not enjoyed by the community at large), any injurious affection occasioned by the taking can be reduced by the amount of the betterment attributed to special benefits. The amount of any betterment can only be set-off against any injurious affection sustained by a remainder. Betterment cannot be applied to reduce a property-owner’s statutory right to always receive at least the market value of land taken. A partial taking that results in two remainders, one whose value is disproportionately enhanced and the other whose value is disproportionately diminished, both relative to the before-taking value, the net effect of weighing the value of one remainder against the value of the other, may give rise to either injurious affection (damages) or betterment. A partial taking appraisal prepared in compliance with the provisions of the relevant expropriation act and in compliance with recognized appraisal standards, with appropriately supported opinions of value presented in an unbiased, clear and convincing manner will assist the trier of fact in fixing the amount of compensation to which an affected property owner is entitled. Public Works defined as “structures, as roads, dams, or post offices, paid for by government funds for public use,” http://dictionary.reference.com/browse/public+works. 2. Unlike in the US, where the Fifth Amendment provides: “nor shall private property be taken for public use, without just compensation,” in Canada, no property owner of land expropriated by statute for public purposes is entitled to compensation. Therefore, in Canada, the federal government and each province and territory has passed a variety of expropriation acts that define the elements of compensation, and there is an assumption that there will be compensation for expropriated land, unless specifically precluded. 3. In Gardiner Burton Agencies Ltd. v. Nova Scotia Power Corp. (1986) NSCA, the court ruling emphasized that the “after” value must be independently estimated, with the result deducted from the “before” value in determining the amount of compensation due for injurious affection. 4. The scheme represents the intended public purpose underlying the necessity or justification for an expropriation. In valuing the property before the taking, the influence of the scheme is to be ignored. After the taking, the value of the remainder takes the influence of the scheme into account, and any special benefits flowing from the scheme. See Windsor (City) v. Paciorka Leaseholds Limited, 2012 ONCA 431 (CanLII). Leave to appeal denied by the Supreme Court of Canada. 5. Appraisal Institute, The Dictionary of Real Estate Appraisal, 5th ed. (Appraisal Institute, 2010, p. 166). 6. Appraisal Institute, The Dictionary of Real Estate Appraisal, 5th ed. (Appraisal Institute, 2010, 167). 7. Appraisal Institute, The Appraisal of Real Estate, 13th ed. (Appraisal Institute, 2008, 15). 8. “Appraisals for expropriation can incur hypothetical conditions, and may require the appraiser to invoke the Jurisdictional Exception protocol [see 3.6],” CUSPAP, effective January 1, 2012, Appraisal Standard 7.12.4. 9. Appraisal Institute, The Dictionary of Real Estate Appraisal, 5th ed. (Appraisal Institute, 2010, 122). 10. Creative Stretch Fabrics Ltd. v. Pitt Meadows (District) (1994), 54 L.C.R. 128, (B.C.E.C.B.). 11. Also applied in McIlwaine v. Saskatchewan, 2000 SKQB 326 (CanLII); Holdom v. British Columbia Transit (2005), 85 L.C.R. 198, 32 R.P.R. (4th) 58 at para. 93 (B.C.E.C.B. ); Lulu Island Holdings Ltd. v. GVSDD, 2007 BCSC 938 (CanLII). 12. According to Eaton, in the US, “it is well settled, at least within the context of an action for just compensation under the Fifth Amendment, injuries to a landowner’s business are not compensable.” Real Estate Valuation in Litigation, 2nd ed. (Appraisal Institute, 2005, 58). 13. This is known as the ‘Edwards Rule,’ and stems from the English Court of Appeal ruling in Edwards v. Minister of Transportation (1964) 2 Q.B. 135. Not all jurisdictions in Canada follow the Edwards Rule. For example, Alberta’s expropriation act is not as restrictive as the Edwards Rule, and compensates for injurious affection if it results from the taking or from the construction or use of “the works for which the land is acquired.” See Landex Investments Ltd. v. Red Deer (City), 1991 ABCA 199 (CanLII). 14. Todd, The Law of Expropriation and Compensation in Canada, 2nd ed., 1992, Carswell Thomson Professional Publishing, p.335. 15. Claims for personal or business damages should be addressed separately and not as part of the value of the real property. 16. Ammouri v. Ministry of Transportation, 2008, OMB Decision LC060014. In Vaness v. Kamloops (City), 2002 BCSC 663 (CanLII), while acknowledging the difference in the before (without the dyke) and after (with the dyke) valuations is an appropriate measure of damages, the court rejected the appraiser’s evidence, which consisted of an analysis of unrelated waterfront lots province-wide as the basis for a 30% depreciation in value. The court awarded a nominal sum of $1,000. The appraiser was also criticized for exceeding his jurisdiction when he stated that “the primary function of his appraisal report was to assess the damage claim,” a role reserved for the court. 17. Kirk Corson, Rural Settings: Valuation of Partial Acquisitions and Damages, Right of Way (May/June 2008, 18-22). 18. In a 1994 study Determination and Evaluation of Remainder Characteristics Which Significantly Affect Right-of-Way Costs, prepared by Texas Transportation Institute, a survey of various groups, including appraisers and highway right-of-way government professionals, ranked in order of most importance as impacting the quantum of remainder damages: 1) change in highest and best use; 2) size of remainder; 3) location of access to abutting highway; 4) development capabilities; 5) shape of remainder; 6) width of remainder abutting highway; 7) grade level of abutting highway; and 8) length of remainder (depth from highway)/amount of access to abutting highway. http://d2dtl5nnlpfr0r.cloudfront.net/tti.tamu.edu/documents/1390-1.pdf. 19. Carol Lansing, and Mark Savin. Assessing and Mitigating the Zoning Impacts of a Partial Taking, Condemnation, Zoning and Land Use, 2009 Annual Review, American Bar Association. http://www.faegrebd.com/webfiles/lansing_reprint.pdf. 21. Cost-to-cure also has application where a viable remainder sustains some diminution in value, the loss of which can be mitigated completely or partially at a cost that is less than the corresponding diminution in value without incurring the expenditure to undertake the cure. See Gene Reilly, Wu Sun, Louis J. Pignataro, and Nicholas J. Monahan, Jr., ‘Partial Acquisitions of Right of Way in New Jersey,’ The Appraisal Journal (Appraisal Institute, January 2000), 64-71, for an analysis of the cost-to-cure involving partial takings for a number of different types of properties. A copy of the actual study can be downloaded at http://ntl.bts.gov/lib/21000/21400/21467/PB99119513.pdf. 23. Michael Wolff, ‘Value Vs. Size in The Real Estate Market,’ Right of Way (July/August 2007), 36-31, applying linear regression analysis. http://www.irwaonline.org/eweb/upload/0707-5.pdf. 24. The Appraisal Institute, Uniform Appraisal Standards for Federal Land Acquisitions (Appraisal Institute, 2000, 18). 25. See Caldwell & Ross Limited v. New Brunswick (Transportation), 2009 NBQB 329 (CanLII) for a discussion of the larger parcel and how market value is impacted by parcel ‘size.’ http://www.canlii.org/en/nb/nbqb/doc/2009/2009nbqb329/2009nbqb329.pdf. 26. Copy available at http://www.tpsgc-pwgsc.gc.ca/biens-property/documents/pubs-re39-eng.pdf. 27. Tony Sevelka, ‘Expropriation and Condemnation: The Larger Parcel,’ The Appraisal Journal (January 2003, 75-93). 29. Burmont Holdings Ltd. v. Chilliwack (District), 1994 CanLII 3326 (BC SC). Use restriction negatively impacts market value. 32. A nearby airport or crematorium would likely have a negative impact and preclude ‘residential’ development even it were a legally permissible use. 35. An economic use that fails to meet the initial tests of physical possibility and legal permissibility at a probability level greater than 50% is precluded from further consideration in the highest and best use analysis. 36. In Thoreson v. Alberta (Ministry of Environment), 2012 ABCA 170 (CanLII), the appeals court ruled that the property owner’s evidence was flawed and of limited assistance: “Despite acknowledging development of the subject lands depended on assessing both costs and demand, the…experts did neither. This…constitutes a fatal flaw in their analysis and I give their evidence little weight. Specifically the suggestion that but for the RDA/TUC [scheme] the subject lands would be fully developed and serviced as at March 31, 2004 is rejected. Therefore, the Plaintiffs’ appraisal of $400,000.00 per acre of the expropriated lands which assumed the full servicing and full development as of the effective date is of limited assistance to the…ultimate determination of value.” The lower court also cited the numerous steps necessary in the development process overlooked in bringing the raw land to a serviced state and fully developed as industrial lots. The court fixed the market value of the lands at $84,500 and $87,000 per acre. 37. 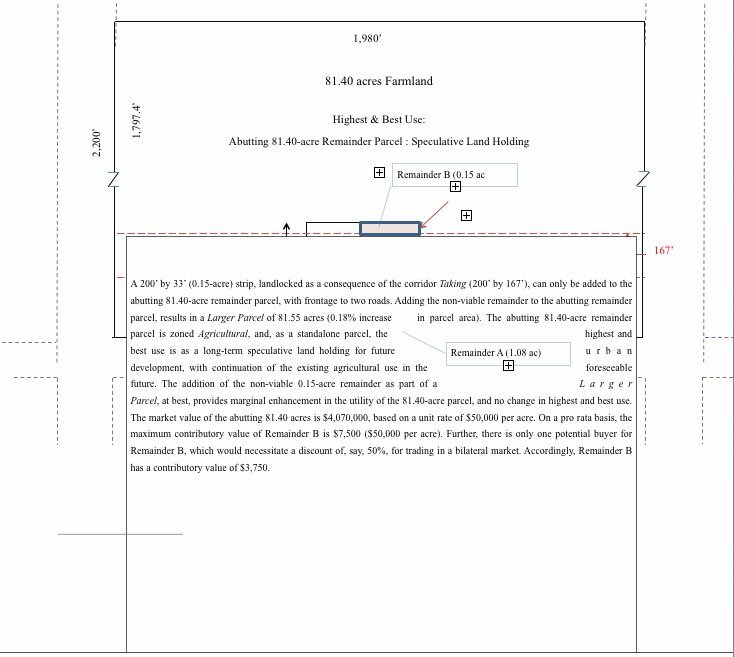 A title search is required of each abutting property that has the potential to form part of the larger parcel, in concert with a non-viable remainder, to identify any legal constraints (title restrictions on use) and physical constraints (registered easements) relating to highest and best use analysis. 38. The terms non-viable property and non-viable parcel are used interchangeably, and have been variously defined as “a parcel of land, which, on its own, would not be eligible for a building permit” (Town of Milton); and “a parcel of land that is landlocked” (Infrastructure Ontario). The Ontario Ministry of Transportation defines “non-viable parcels are those that are not capable of independent development. They may be irregularly shaped, have limited or no access, or have other deficiencies preventing their independent use or development,” Real Property Appraisal Guidelines (February 2008, 26). 39. Gordon E. MacNair, ‘Value in Contribution & Landlocking,’ Right of Way (January/February, 12-17), describes a number of actual transactions of remnants trading at various discount rates in a bilateral market. 41. Ontario Ministry of Transportation, Real Property Appraisal Guidelines (December 2008, 26). 42. Moller v. Canada (Transportation), 2008 CanLII 88538 (AB LCB). See Alberta (Transport, Minister) v. Bonaventure Sales Ltd., 1980 ABCA 142 (CanLII), in which the appeals court mandated application of the concept of the larger parcel to value expropriated strips of land inappropriately assigned values as independently ‘saleable acreage’ by the Board. http://www.canlii.org/en/ab/abca/doc/1980/1980abca142/1980abca142.pdf. 44. Damages (injurious affection) arbitrarily computed as a percentage of the before-taking value or the residual value after estimating the contributory value of the part taken as part of the larger parcel fails to consider the value of the remainder in any meaningful way, and conceals the magnitude of the damages claimed without regard to the value of the remainder. 45. In F & F Realty Holdings Inc. v. Ontario (Ministry of Transportation), 1998 Carswell Ont 3046, 64 L.C.R. 52, the Board deemed the highway exit ramp constructed in connection with part of the land expropriated to have had both a positive (special benefit) and negative impact (injurious affection) on the 15.2-acre remainder, with the betterment attributed to 13.2 acres outweighing the injurious affection assigned to two acres, thereby, restricting compensation to the market value of the land taken (4.3 acres). 46. In Kodila v. British Columbia (Ministry of Transportation), 2007, BCSC, while the “before and after method” indicated that the diminution in value occasioned by the partial taking was $2,074, the court awarded the property-owner $7,818 as the contributory value of the land taken as part of a larger parcel. 47. The onus to prove betterment lies solely with the expropriating authority. Lafleche v. Ministry of Transportation and Communications (1975), 8 L.C.R. 77 at 86 (Ont. Div. Ct.); and Thunderbird Entertainment Ltd. v. Greater Vancouver Transportation Authority, 2012 BCCA 294 (CanLII). 48. All provinces, except British Columbia, and the federal government restrict set-off of special benefits to injurious affection. British Columbia allows set-off of special benefits against the total claim for compensation.